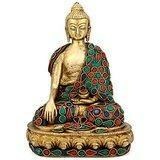 Give to your home the feel of serenity with this brass sculpture of Lord Buddha, a god in Hinduism Buddhism. Lord Buddha, according to Hindu mythology, is known to bring enlightenment to his believers and worshippers. Buddha means "awakened one" or "the enlightened one." "Buddha" is also used as a title for the first awakened being in an era. Buddha taught a Middle Way between sensual indulgence and the severe asceticism found in the Sramana (renunciation) movement. Install this statue at your home temple for performing Puja and Upasana in the Hindu way. Or, place the statue at vantage points at home or office to draw inner strength. Size : 8 Inches Height X 6 Inches wide X 4 Inches depth.Weight : 2 kg. Material : Brass, With Turquoise and other coral stone Handwork. Deepen your worship or add distinction to your decor with a genuine handmade Indian statue unlike anything you've seen before. Order the Handmade Indian Brass Idol today.